Prepare for The Bard's Tale III: Thief of Fate, along with plenty of new features and fixes. Last December, inXile Entertainment made scores of people happy with the release of The Bard's Tale on iOS, a port of the 2004 gem that appeared on PS2, Xbox and PC. Thankfully, the developer chose to extend the experience by releasing more content via free update, which brings us to today. Yup, The Bard's Tale is even cooler, thanks to the addition of The Bard's Tale III: Thief of Fate, the third chapter (available with in-game download) that completes the trilogy. What's more, users will enjoy the ability to share characters between the first two classic games, widescreen support for iPhone and iPad, the option to use tokens to extend the Bard's stats beyond level 20, compatibility with the 60beat controller, recovery of progress whenever the app closes, improved iCloud synching and crash fixes. 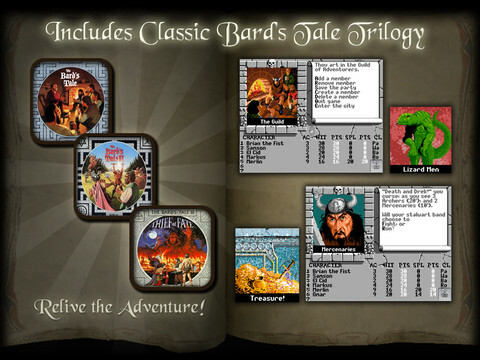 "The addition of Bard's Tale 3 completes the classic trilogy and wraps all the Bard's Tale games into one nice package for fans on iOS," said Brian Fargo, of inXile Entertainment. "It has been great to give older gamers a chance to replay the original trilogy and introduce these classics to new gamers as well, thanks to the iOS platform." Ah yes, and the game's on sale for $2.99 over the next two weeks. Can you say bargain?